How do you motivate young people to think critically about connections between the media and their health? The Eunice Kennedy Shriver National Institute of Child Health and Human Development (NICHD) created Media-Smart Youth: Eat, Think, and Be Active!® to do just that. This interactive education program teaches youth age 11 to 13 about the complex media world and how it can influence their health. Media-Smart Youth includes 10 lessons with activities that explore media, nutrition, and physical activity. The curriculum concludes with the “Big Production”—in which participants create media products to motivate their peers to eat healthy and move more. Throughout the program, youth analyze advertisements, make media messages of their own, try healthy snack recipes, and discover fun ways to be physically active. Media-savvy skills are especially important today because young people are spending more time using media—from television, radio, and movies, to video games, social networking sites, and online videos. This rising use of media, which is tied to a less active lifestyle, and exposure to ads for less healthy foods are contributing factors to higher rates of childhood obesity. Media-Smart Youth’s 10 lessons focus on four key areas: media awareness, media production, nutrition, and physical activity. IQ Solutions works collaboratively with NICHD to raise awareness about Media-Smart Youth among youth-serving organizations nationwide and provides organizations with technical assistance to support their efforts in implementing the program. We also helped NICHD develop a funding and outreach strategy that resulted in awards of $15,000 each to 10 organizations that implemented Media-Smart Youth in their communities. On behalf of NICHD, IQ Solutions later conducted interviews with these organizations to glean and share lessons learned. We found that one of the most popular program components was the chance for youth to create and share their own media materials. IQ Solutions is now collaborating with NICHD to empower teens by helping them implement Media-Smart Youth in their own communities. In 2014, the Institute launched the Media-Smart Youth Teen Leaders Program. 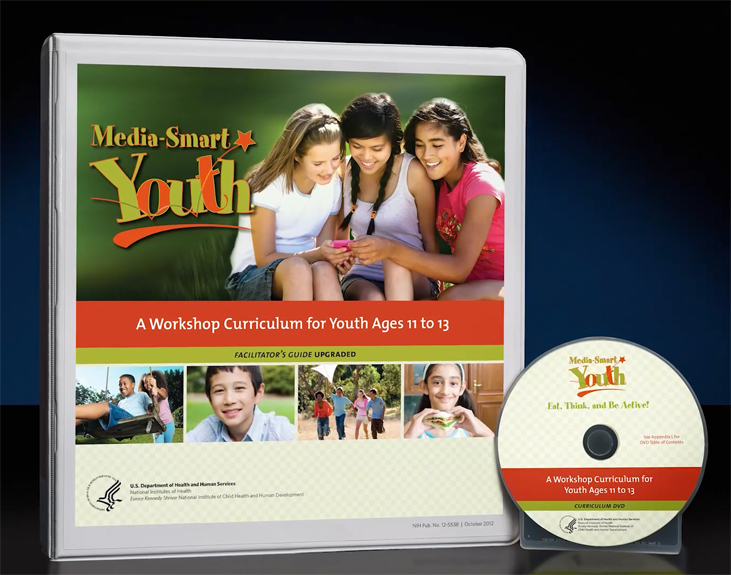 Teens and young adults age 15 to 20 use the curriculum to carry out Media-Smart Youth from start to finish—from identifying a program site and recruiting youth, to teaching the lessons and providing feedback. The teen leaders partner with an adult advisor to help plan the program and with a community organization to assist with the funds. Teen leaders receive leadership experience, community service hours, and recognition from NICHD. To help them succeed, the Institute provides training, ongoing assistance, and funding (if available) for program expenses. IQ Solutions has worked closely with NICHD on all phases of the Teen Leaders Program. We helped conceptualize the program, developed and executed the application process, and created and distributed promotional messages and materials. To raise awareness about Media-Smart Youth, IQ Solutions marketed the program to national youth-serving and professional organizations and provided web badges, a flyer, and promotional language for organizations to distribute through their own communication channels. NICHD received 89 applications from candidates with diverse socioeconomic and racial/ethnic backgrounds from 29 states and the U.S. Virgin Islands. The teen leaders selected a variety of local organizational partners, including 4-H councils, schools, community mentoring programs, faith-based organizations, and local affiliates of youth-serving organizations such as Girl Scouts, Boys & Girls Clubs of America, YMCA, Girls Inc., and Kiwanis clubs. NICHD made awards to 58 applicants and, in collaboration with IQ Solutions, conducted two trainings attended by each teen leader and advisor. We continue to support the Institute by coordinating check-in calls, responding to questions, assisting teams in completing paperwork, developing templates for promotional materials, and tracking the teams’ progress. In addition, IQ Solutions is working with NICHD to gather feedback from teen leaders and other Media-Smart Youth participants to learn more about program accomplishments, challenges, and best practices. IQ Solutions looks forward to continuing our work on the Media-Smart Youth program and providing communities with the technical assistance and resources to help them educate youth about making informed decisions about nutrition and physical activity and establishing healthy habits that will last a lifetime.